The second thing I learned after 31 signings in two months is that people don't care about price. 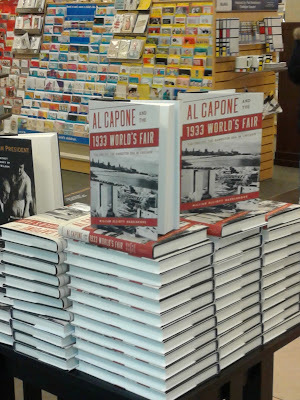 Al Capone and the 1933 Worlds Fair lists out the door at 36 dollars and my other two nonfiction titles Madam President The Secret Presidency of Edith Wilson and Forging A President How the Wild West Created Teddy Roosevelt lists out the door at about 32 dollars On an average I would sell every signing 20-50 hardcovers. I can count on one hand the number of times people did not buy because of price. If the story is good and people want the book then people are willing to pay. People want something for free. Even if it is something small. It is an icebreaker if nothing else. I give them a small business card with the name of my book on it and that initiates a conversation. It is nothing really but a reason to stop and if they don't buy they take it with them and there is a chance they may buy later. I have had many people circle back later and buy a book. Also I learned people you don't think will buy will surprise you every time. So I give everyone a card and I cant tell you the amount of times I was floored when someone I assumed would never buy my book would do it. Authors are their own best salesmen. A signed copy of a book by the author is coveted. People like having their book inscribed to them or to someone they will give it to. Many times people told me they had never met an author before. I am literally surrounded by bestsellers when I am selling books and yet they just lay there and people breeze right past them. I know my book. I can talk to anybody about Al Capone, The Worlds Fair, Sally Rand, Edith Wilson or Teddy Roosevelt. The biggest advantage Barnes and Nobles has over Amazon is that it is full of human beings who interact with other human beings. People like talking to an author who is dressed up in a tie and a vest and who has a story to tell and will also listen to a story. I can't tell you the amount of stories I have heard about Al Capone from people who bought my book. What I learned finally is that it isn't price that sells books and it isn't having an online store at your fingertips. You just need to tell a good story. Believe me... people will listen.